The Cumberland & Dumfriesshire Farmers Mart P.L.C. had forward 600 head at their Annual Ram Fair at Longtown on Wednesday 7th October 2009, with one of the best shows for quality seen in many years resulting in a flying trade from start to finish. The 202 non-registered Bluefaced Leicester Sheep were a larger and better show and attracted a full attendance of buyers, prices were very dear with an overall average of £348.50. Top price of £2,200 for a superb shearling from Messrs Carruthers, Peela Hill, Bewcastle, Carlisle, who sold others at £700, £750 and £700. Other leading prices of £900, £850 and £600 The Side, £580 Park Nook. Ram lambs sold to £500 for a good lamb from Mrs C. MacGillivray, Troutbeck Cottage, Heads Nook, Carlisle, others £280 Raggetsyke, £250 Primside Mill and Parcelstown. Aged rams to £500 and £480 The Row, others £420 Shielsknowe, £380 Fordlands. Ewe lambs to £180 (x2) and £110 The Side. Ewes to £100 Sunnyside and Blackhamilton. 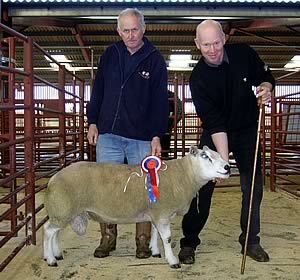 Shearling ram:- 1st Prize and Champion – Messrs Sinclair, Shielsknowe, Jedburgh. 2nd Prize – Messrs Carruthers, Peela Hill, Bewcastle. 3rd Prize – Messrs Aitchison, The Side, Newcastleton. Ram lamb:- 1st Prize – Mrs C. MacGillivray, Troutbeck Cottage, Heads Nook. 2nd Prize – R. Carter, Parcelstown, Longtown. 3rd Prize – R. Fraser, Sunnyside, Penton. Also held was the show and sale of Texel rams and ram lambs on behalf of The Solway & Tyne Breeders Club. The show was ably judged by Mr Robert Carruthers, Blacksmiths Cottage, Penton who awarded the Championship to an outstanding shearling ram from regular consignor Mr A. Bell, Burnside, Kirkton, Hawick which realised £1,550 to D. Bell, Greenknowe, Canonbie. Top price of the day was for the second prize shearling, also from Kirkton which realised £1,600 to D. & D. Aitken, Upper Cleugh, Lockerbie. 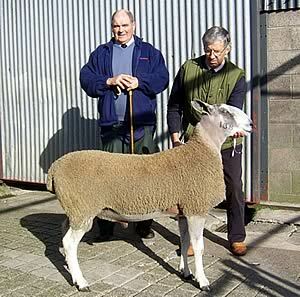 Shearling ram:- 1st Prize– Messrs A.R. Bell, Kirkton, Burnside, Hawick. 2nd Prize – Messrs A.R. Bell, Kirkton, Burnside, Hawick. 3rd Prize – Messrs Robertson, The Becks, Langholm. Ram lamb:- 1st Prize – G. Wilkinson, Arkleby House, Arkleby, Aspatria. 2nd Prize – S. Crozier, Raggetsyke, Waterbeck, Lockerbie. 3rd Prize – H. Woodmass, Harene, Linstock, Carlisle. Mr Bell sold other Texel shearling rams at £1,000 and £700, others to £750 Beckhouse Farm, £680 Flex, £680 (x3) Becks, £650 Kirkton, £620 Becks, £600 Kirkton, £600 Whitcastles. Top averages – Kirkton (11) £793, Becks (8) £566, Whitcastles (3) £560, Crumhaugh Hill (4) £445. Texel ram lambs were also in demand selling to £500 from J. Frame, Little Galla to Mesrs Campbell, Thrunton, others £450 Raggetsyke, £400 (x2), £380 Woodhead. Top averages – Woodhead (10) £287, Little Galla (10) £241, Sandilands (10) £229. Suffolk rams sold to £800 for a lamb from The Lands who sold others at £760, £700, £680, £640, £620, £520 and £500, others £400 Archerbeck. Charolais ram lambs to £440 Pateshill, £320 The Kerr and Pates Hill.